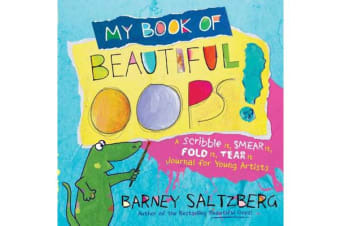 An interactive follow-up to the unique and inspiring Beautiful Oops!, My Book of Beautiful Oops! art activity book encourages young readers to turn every mistake into something beautiful. The friendly, frolicsome alligator from the original book guides readers through the various folded, crumpled, torn, die-cut, bent, smudged, and lift-the flap spreads, prompting them to see what beautiful art they can make out of material that many would consider trash: Finish the words on a torn piece of paper to make a poem. Turn this ink spill into a piece of art. Rip a picture out of the book, tear it into pieces, and use the scraps to create a new piece of art. The sky is the limit!